The sanderling (Calidris alba) belongs to the family of knots, curlews and sanderlings, the Scolopacidae. The sanderling is distributed in North America, South America, Europe, Africa, Asia, Indian subcontinent and Australia. The sanderling species is fully migratory. This sanderling species is polytypic. The sanderling (Calidris alba) is a medium-sized sanderling, measuring 20 to 25 cm in length and weighing 40 to 100 grams. The wingspan is 35 to 40 cm. The adult breeding sanderling has mottled red-brown crown, throat, upper breast and upperparts. The face is reddish brown. There is a blurred lore. The entire belly and vent region is whitish. There is varying levels of redness among the subspecies. The wintering birds have pale gray mottled upperparts and whitish underparts. The juveniles are pale gray and white. The dark bill is short and thick. The short legs and feet are blackish. The irises are blackish. There is a grayish eye-ring. The sanderling call is a repeated, plaintive, nasal, piping sound. The sanderling is distributed in North America, South America, Europe, Africa, Asia, Indian subcontinent and Australia and surrounding islands. The nominate sanderling subspecies C. a. alba is distributed in extreme central and north Russia (Severnaya Zemlya Islands and Taymyr Peninsula), Svalbard (Norway), Greenland and extreme north Canada (Ellesmere Island). This subspecies winters on west and south European coasts, coastal Africa, Coast of Arabian peninsula, coastal Indian subcontinent, southern Asian islands, Australia, New Zealand and some Pacific islands. The sanderling subspecies C. a. rubida is distributed in northeast Russia (Lena Delta and New Siberian Islands), Alaska (USA) and parts of northern Canada. It winters in coastal north and south Americas and eastern coastal Asia. 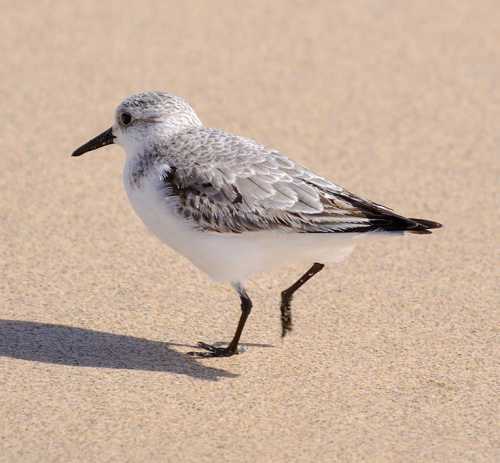 The Important Bird and Biodiversity Areas (IBA) of sanderling in USA are, Cape Hatteras National Seashore and Cape Lookout National Seashore. The IBA in Spain are, Costa da Morte and Ferrolterra-Valdoviño coast. The IBA of these species in United Kingdom are, Ribble and Alt Estuaries, The Wash, Swansea Bay - Blackpill and South Westray Coast. The IBA in South Africa are West Coast National Park and Saldanha Bay islands. 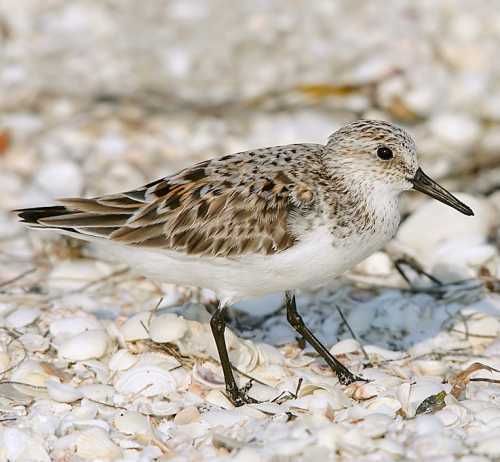 The IBA of the sanderling in Mexico are, Ría Lagartos, Bay Santa María, Estero Cardonal, Delta of the River Colorado and Coastal hunedals of the North of the Peninsula of Yucatan. The sanderling species do not normally occur in forests. They normally occurs in altitudes between 0 to 200 meters. 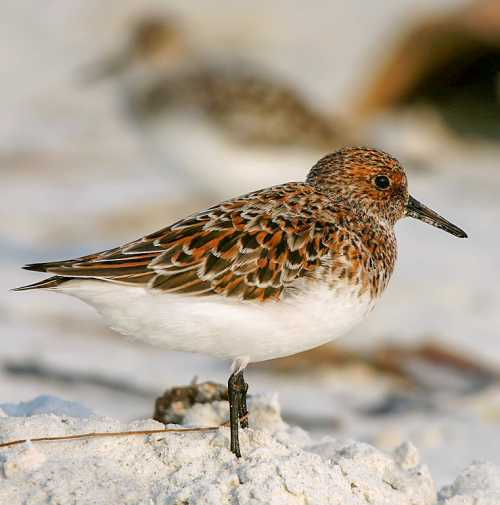 The natural ecosystems and habitats of these sanderling species include tundra grasslands, tundra wetlands, tidal flats, shorelines, estuaries, tide pools, marine lakes and coastal freshwater lakes. The diet of these sanderling species consists mainly of invertebrates. Insects, larval insects, beetles, ants, termites, spiders, crabs, snails, worms, grass, seeds, moss and sedges are their primary food. The breeding season of these sanderling species is during June and July in most of their breeding range. These birds are mostly monogamous; occasional polyandry is observed. They nest solitarily or in small groups. The nesting sites are located in Arctic on barren, stony tundra, gentle slopes or level alluvial plains. The nest is a shallow depression on the bare ground. Sometimes the nest is lined with grass. The nest is usually built by the female. The clutch contains four olive green eggs, with dark blotches. Both the sanderling parents incubate the eggs. The chicks hatch out after 24 days and fledge after 17 days. These sanderling species are fully migratory birds. The breeding populations are found in Arctic and subarctic North America, Europe and Asia. They migrate to the wintering grounds in August and September. These sanderling species return to the breeding grounds in early Arctic summer. They travel in stages through a few stop-over sites during their movements between breeding and wintering grounds. The global population size of the sanderling (Calidris alba) is estimated at 620,000 to 700,000 individual birds (Wetlands International 2015). The overall population trend of the species is reported to be stable. In most of its range, this sanderling species is reported to be uncommon to locally common. The generation length is 8.1 years. Its distribution size is about 13,600,000 sq.km. Ecosystem degradation, ecosystem conversion, severe weather, climate change, pollution, sport hunting and susceptibility to avian influenza are the main threats that may endanger the survival of the sanderling species. The sanderling (Calidris alba) species does not approach the thresholds for being Vulnerable either under the range size criterion, or under the population trend criterion or under the population size criterion. The CITES (Convention on International Trade in Endangered Species of Wild Fauna and Flora) status is ‘Not Evaluated’ for the sanderling (Calidris alba). C. a. rubida (J. F. Gmelin, 1789). Recently updated and current topic in Bird World: Sanderling - Calidris alba.